Omigosh, omigosh, OMIGOSH! It’s here, it’s here, it’s here! I had about 800K in gold saved up, so I ended up spending about 1300 gems to fill my Gold Storages for the upgrade (1.8M gold) then I gemmed the timer (another 1300 or so gems). At that point, this little beauty popped up…. Now THAT’S a deal. I mean, sure, if you’re all about F2P then you would prefer not to spend ANY money, but come on…. 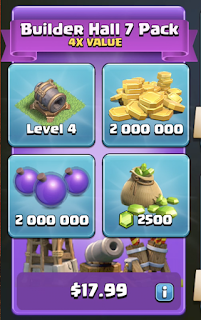 A LEVEL 4 GIANT CANNON! That’s 4.5 days of upgrade time and 8.6M gold. 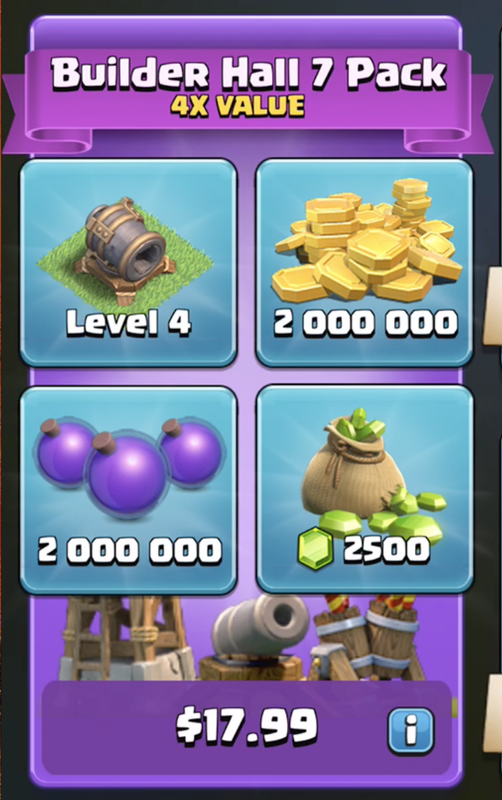 That ALONE makes the deal but then they throw in 2M gold and elixir which, BTW, will be allowed to overflow your storages because they let bonus packs do that. So…my elixir storages, which have been at 2M for a while now, suddenly jump to 4M. What does that mean? Well…it means that I buy the fifth Army Camp right away. The additional 2M in gold is enough to buy the 4 new wall units, the new FireCrackers, the new Hidden Tesla…. You guessed it - for the low, low price of 40 bucks, I have a fully deployed BH7 base with a level 4 Giant Cannon. You just can’t argue against that ‘un and I think we’ll see a BUNCH of new, fully deployed BH7 games real fast. Next up, of course - the Drop Ship. I gemmed the Barracks and picked up my brand new, level 1, Drop Ship. The initial stats weren’t all that fantastic, but I thought - hey, let’s take ‘em for a test drive and see how they do. Their hitpoints are pretty impressive - a level 1 Drop Ship carries 1200 HP. For comparison, a level 12 Baby Dragon only has 967 HP so they should be much better tanks. I agree with early reports of their tankiness - I can see that this troop will be worthwhile as an air tank once they’ve been upgraded sufficiently. They'll be for air attacks what Boxer Giants are for ground attacks. One thing, though - the AirBombs absolutely chew through the Drop Ship, so use them on the opposite side unless they’re just a distraction while your Beta Minions take the AirBombs down! The level 4 Giant Cannon has what looks to be just so-so specs, but it’s real power is in what it can do to the Battle Machine. As soon as the upgrades were done, I did a quick redesign of the Pagoda Diamond. Relatively minor, really - it’s just an interim base while I work on some new, stronger base designs. Naturally, I took my newly minted BH7 out for a spin around the block. The first attack I ran was an upgraded form of my beloved Mitch attack. I added a third camp of Beta Minions.This was against a form of the BH6 brackets base with two L shaped sides around the core. The attack went very well - 80% two-star. My opponent ran Bombarian against the northern apex of my base; he ended with a 45%, zero-star result. The Giant Cannon was decisive. As expected, his attack did really well at blasting its way through the top of the base and even taking down the northernmost defenses. BUT...as soon as the BM stepped up to the BH to take it out, the Giant Cannon took him out. The second attack was my first attempt at Minion Drops - 3 camps Beta Minions, 2 camps Drop Ships. The idea was to send the Drop Ships in as tanks while the Beta Minions cleared from a slight distance. Naturally, I drew the classic Brackets Base. (Did I mention how much I hate this base…?) The Drop Ships did alright though - even at level 1, they were able to work their way right up to 1 row out from the BH before the roaster took them down. (They also cleared the Guard Post Troops.) This exposed the Beta Minions to the Roaster, but there were enough at the edges to get down the topmost Crusher. I held the BM back until it was down then sent him in where he actually pathed exactly right and took out the BH for a 59% two-star. 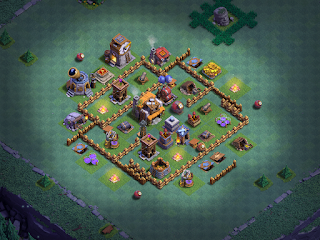 This base was a mixture of level 5 and level 6 defenses, but it was also a BH6. The other player tried a Bombarian on the new base as well - he came out with a 43% one star, so he DID get the BH but that was all the further he managed to go. The other big improvement here is the trophy loot cap increase! Max loot is now 500K per day at 4000 cups. 100K may not seem like a lot, but it’s actually quite a bit in the big scheme of things. The brackets for a player at 4000 trophies is 150K/150K/200K. It looks like 3200 gets you 125K/125K/165K, 3400 nets 130K/130K/170K, 3600 is 135K/135K/180K, and 3800 is 140K/140K/190K. That’s not too shabby and is a much needed boost to daily loot levels. At this point, I have all the new toys deployed and I’m in upgrade mode. I haven’t decided how many gems I’ll use to advance the game; I’d like to get Drop Ships upgraded as far as I can just to be able to play with them a bit more. Minion Drops is a fun attack strategy - watching all the Larrys swarming about is kinda cool. I’m loving the improved Mitch and can’t wait to see how level 14 Night Witches perform. What to do with my other games…that is the next question for me. I’m considering springing for the BH7 Bonus Pack on one or more of them when I get them upgraded, but I think I’m going to let them build a bit more at BH6 a while. My main game is BH7 and that’s really the only one I need for our articles and videos. I can still put out BH6 content and there will be LOTS of players who continue to work through BH6, so it will be useful for monitoring the meta. The Phoenix Abyss Hyper-Rush Project (PAHRP) will continue unabated - as soon as I have all of the necessary upgrades completed to meet our original upgrade plan, I will upgrade the BH again. The timing of BH7 dropping is actually on-spot for the PAHRP game - I just started the level 12 Beta Minion upgrade a day or so ago, storages are upgrading, several defensive structures on the base are now at level 4…so it’s in decent shape and everything is right on time. The big question here, though - what is BH7 going to do to the game’s meta? Well…it is definitely a meta changer. BH6 simply stands no chance against BH7, much like BH4 has little to no chance against BH5 and BH5 found it rough to compete with decent BH6 leveled games. As such, I predict most BH6 players will be kicked out of the 4000+ club within this season and likely not even appear at or above 4000 cups in the next season (same as what happened to BH5 shortly after BH6 was released). I’ve been on both sides of that stick and I can predict with confidence that all but the best, BH6 attackers are going to be losing LOTS of trophies this week. The trophy rankings will quickly re-align to this new meta as well. I think BH3 will still find its top spot at around 1000 trophies, BH4 will still top out around 1800 trophies, and BH5 will likely drop to a top spot of 2400-2500 trophies. BH6, if things go as I'm thinking, will find its top spot between 3300-3500 trophies. That’s better than max loot just a day ago (before the BH7 release) so that should not really upset anyone. The real improvement, though, will be for the lower BH levels who experience so many underdog matches so early in the trophies. My BH4 games were seeing BH6 games as low as 1200 trophies just a month or so ago, and BH5 was fighting BH6 exclusively by no later than 2200 trophies. This was bad - bad for the players, bad for the game. Increasing the loot cap and trophy ranges that carry loot are an absolute boon to the meta. Players will be encouraged to move up through the ranks to get more loot and that will offer a measure of relief to the lower trophy ranks. Lots of players will rush fast to get to BH7 - that’s also a good thing for the lower BH levels. If you think BH6 stands little chance against BH7 with its fifth camp, Giant Cannon, third FireCrackers, and second Hidden Tesla, then just imagine BH4 and BH5 players going up against fully deployed BH7 games. All those players who hyper-rushed to BH6 to gain competitive advantage will do the same with BH7 and, once they’re there, they will win like crazy all the way up into the upper 2000s or lower 3000s. There’s absolutely zero doubt in my mind on this one - BH7 will get you over 3000 cups fast. That means those players - who were struggling BH6s in the lower trophy ranks, beating up on BH5s and the occasional BH4 - are going to clear out fast. Keep in mind - it will take the better part of this season for all these changes to shake out. There’s going to be growing pains here, and a lot of players are going to complain about how unfair the matches are and the like. That’s normal - things will be topsy turvy, upside down, and corkscrewed all over the place as the meta adjusts and stabilizes. It will all even out, though, and I really think it will be much improved overall! The video has the whole upgrade process, redesigning the base, and “live” play of the new Mitch and Minion Drops attack strategies.